Is it the total of the extra common area construction added to each flat/shop equally? Is it decided as per the wish of the Builder? Ideally it should be the total of the extra common area construction, but then do you get that report from the builder? Rarely any builder will provide you that data. Few years back, the loading was 15-25%, then it became 25-35% and now the standard followed by most in Surat is 40%. But lately it has even come to attention that some projects have a loading of 47% -53%. We can agree to some extent if the developer has built some extra amenities, or left the passages and corridors bigger or made extra basement parking which wasn’t required by law, and if they calculate such things in super built up. But is it the way the super built-up calculated. A 50% loading means that 50% of the all the carpet area is made for common usage. But does that always happen? Or is the loading MARKETING GIMMICK? Builder A is selling a flat A of 1000 sq ft super built-up . Builder B is selling a flat B of 1000 sq ft super built up. It’s very easy for a common man to get confused and consider that the Flat B is cheaper, but actually he is wrong and making a wrong deal. Surprising we have observed that even regular real estate Investors have made decisions without considering the loading factor. A good property broker will guide users on such un-shown facts of property buying. Note: The good side of the Surat Market is the builders are clearly informing (If asked) the users about how much is the loading, thus it is then up to the user to check out on their own if that is justified or not. In case you find difference in loading factor of 2 flats, then you can always check the extra amenities between the 2 projects and you can find on your own is the loading factor is justified or a gimmick. Please share / like this article if you feel this happens and people of Surat should be aware of this. Buyers are not fool enough that they will pay blindly. I thank that most people check this out before buying a new property. However, in case of resale of old flats the sellers/brokers often hide the real loading by not making available the floor plan. Also there are some builders who verbally tell a lower loading. However, on actual calculation from the floor plan the loading is much higher. some of them add unusable areas like flower beds in the carpet area. Thank you for giving more clarity on this subject. I think the Surat Builders Association SBA-Credai which claims to do all ethical practice should intervene and formulate something here. Like what Vikas said abouve, a 10 year old flat can be now sold by putting 40% loading instead of the original 20% because no document even mentions about this loading factor clearly. Its like what ever the seller wants to say he can, and leave up-to the buyer to do the calculations. Nice article! 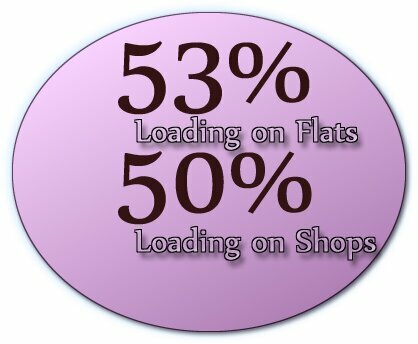 I have recently come across property in Navsari where loading is as high as 60% !. The carpet area (as per document) comes to 1100sq.ft whereas builders are charging us for 1800sq.ft!. Can anybody tell me what is the law of the land? All transactions will be done using Super built up area in surat-navsari?Please help. This site owner is also a broker and if he really have intention to help buyers here put the laws and regulation body to inform about legal loading requirement. No one in surat will do that.